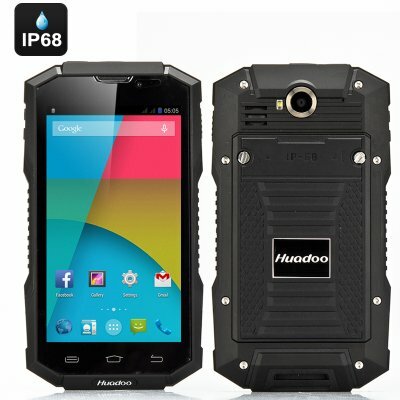 Successfully Added Huadoo V4 Rugged Smartphone - Quad Core CPU, 1GB RAM, IP68, Gorilla Glass II, Android 4.4 OS (Black) to your Shopping Cart. The Huadoo V4 Rugged Smartphone has an IP68 waterproof rating, Gorilla Glass II and uses as Quad Core CPU with 1GB or RAM running Android 4.4. Huadoo have just launched their latest tough and ready rugged Smartphone and its called the V4. A rubber tough exterior and Gorilla Glass II protective screen keep this device safe from the elements; therefore earning it an IP68 rating and also made it shockproof so it can withstand the toughest of life’s environments. Behind that tough scratch resilient Gorilla Glass II protective screen is a beautiful 5 inch capacitive display that shows all your content in vivid 960 x 540 resolutions. To compliment this you get some real power under the hood in the form of a Quad Core MTK6582 processor with 1GB of RAM and a Mali 400MP2 GPU for greater graphics ability. When combined this results in an outstanding performance for all your needs. With the latest Android 4.4 OS running on this device you get access to the best features on offer from Android as well as access to the vast array of apps and games available form the pre-installed Google Play store. The Huadoo V4 has two cameras for your enjoyment, the rear on is an 8MP and lets you snap shots of your adventures while the front facing 2MP camera is suitable for extreme selfies to make friends and colleagues envious of your latest’s adventures.